Those molecules basically behave like the green (or red, if you’re a Sith Lord) glowing stuff you’d find in a lightsaber. Mikhail Lukin, who led the team along with Vladan Vuletic, says science reflects that of the movies. 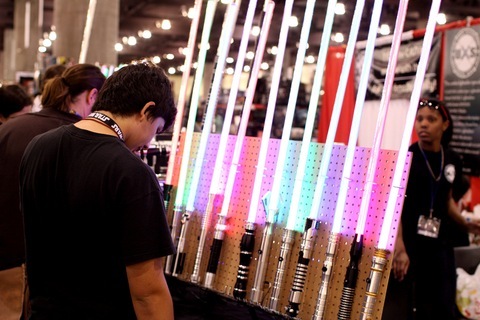 “It’s not an in-apt analogy to compare this to light sabers. When these photons interact with each other, they’re pushing against and deflect each other. The physics of what’s happening in these molecules is similar to what we see in the movies,” said Lukin. And even if you aren’t a Star Wars geek, the science behind all this is groundbreaking. Photons have never before bound together, and until recently, this state of matter had been purely theoretical. To make them bind, the scientists had to blast photons through a cloud of rubidium atoms, forming something known as a “Rydberg blockade.” And if that doesn’t sound like science-fiction, I don’t know what does. Plus, Mikhail Lukin is looking towards future applications. “It feeds into the bigger picture of what we’re doing because photons remain the best possible means to carry quantum information. The handicap, though, has been that photons don’t interact with each other,” said Lukin. Which means this discovery might lead to advances in quantum computing. So…instead of Star Wars, we could be getting 2001: A Space Odyssey.